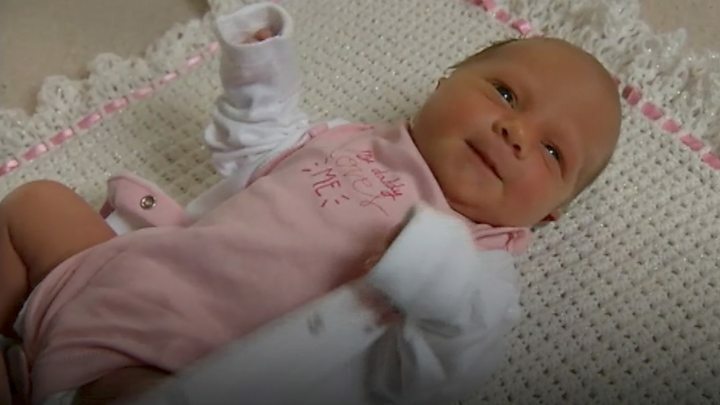 A new mother has thanked a lorry driver who carried her car over a flooded causeway while she was in labour. Kelly Brinkman was in labour and waiting for 3ft 6ins deep (1.2m) sea water to recede on The Strood Causeway from Mersea Island, Essex. Justin Tacey, 45, offered to put her car on his lorry and drive across. Mr Tacey inched through the rising tide to get her on the road to hospital, where her breech baby girl was delivered by Caesarean section. Ms Brinkman and partner Paolo Pereira had driven to different places to get off the island last Thursday but were prevented by the high tide. Ms Brinkman said: “I am just so grateful to Justin. He probably saved the baby’s life because she was in a breech position and well on her way. The only way to save her was a Caesarean section. Mr Tacey, who works for Emmitt Plant at Diss in Norfolk, said he had been on the island making a delivery and was waiting for the coastguard to let him cross back over the causeway. “I noticed a man looking panicky on the phone and we got chatting,” he said. Mr Tacey said he spoke to the coastguard team and suggested he could carry the couple’s Ford Kuga through the water on the back of his lorry. “It took about five minutes to cross the half mile causeway slowly and carefully,” he added. West Mersea Coastguard also paid tribute to Mr Tacey, calling him a “true gentleman”.